From Gregor Blanco patrolling the outfield for the 2012 and 2014 champion San Francisco Giants, to Kris Medlen pitching in the ALCS and World Series on the way to a title with the Kansas City Royals in 2015, to Charlie Morton turning in the relief performance of a lifetime to win Game 7 of the 2017 World Series for the Houston Astros, former Gwinnett players have had a major influence on Major League Baseball's Postseason over the last nine years. 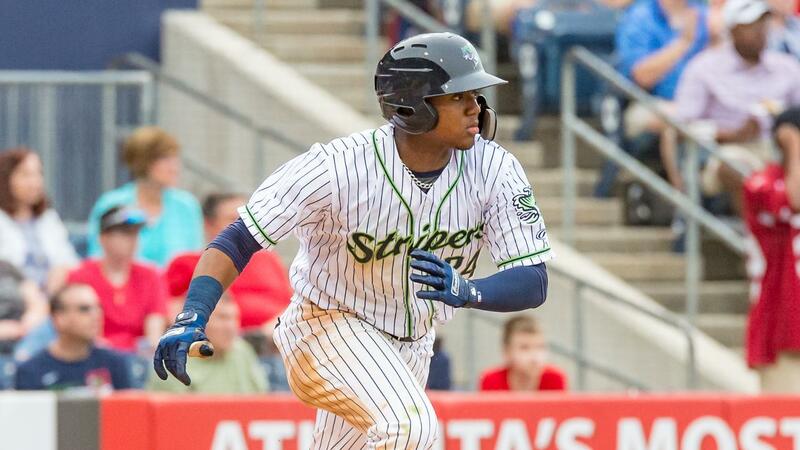 As eight teams - including Gwinnett's parent club, the Atlanta Braves - begin the American League and National League Division Series this week, here's a look at the former G-Braves and Stripers hoping to make an impact on baseball's biggest stage. Atlanta's surprising run to the NL East Division title included regular-season contributions from 49 players who have played for Gwinnett, 39 of which suited up for the Stripers in 2018. Eighteen of those 49 players are on the Braves' 25-man NLDS roster: pitchers Mike Foltynewicz, Max Fried, A.J. Minter, Sean Newcomb, Anibal Sanchez, Chad Sobotka, Julio Teheran, Touki Toussaint, Jonny Venters and Arodys Vizcaino, catcher Tyler Flowers, infielders Ozzie Albies, Johan Camargo, Ryan Flaherty and Freddie Freeman, and outfielders Ronald Acuña Jr., Lane Adams and Ender Inciarte. Five of the Braves' NLDS position players spent time with Gwinnett this season, headlined by NL Rookie of the Year candidate Acuña Jr. The 20-year-old outfielder sparked the Braves' offense after arriving in late April, batting .293 with 26 homers, 64 RBIs and 16 stolen bases in 111 games. His historic rookie campaign came after a slow start with the Stripers, when he batted .232 with one homer, two RBIs and four steals in 17 games from April 6-24. Acuña Jr. will be better remembered for his 2017 season with the G-Braves, when he hit .344 with nine homers, 33 RBIs and 11 steals to wrap up the Baseball America Minor League Player of the Year award. Adams (.191, 6 RBI, 3 SB in 30 games) and Flaherty (.267, 4 RBI in 8 games) both spent time on Gwinnett's regular 25-man roster in 2018, while Camargo (.303, 3 HR, 6 R, 7 RBI in 8 games) and Flowers (.000, 1 RBI in 2 games) both played on rehab assignments. Camargo's rise to everyday Major Leaguer status was influenced by a hot start with the G-Braves in 2017, when he batted .311 with four homers and 20 RBIs in 31 games between April and May. Freeman and Albies both passed through Gwinnett on their way to Atlanta stardom in previous seasons, each winning an International League Postseason All-Star award in the process. Freeman batted .319 with 18 homers and 87 RBIs over 124 games with the G-Braves in 2010, capturing the IL Rookie of the Year award. He has since returned to Gwinnett on rehab assignments in 2013, 2015 and 2017. Albies, after hitting .248 in 56 games on his Triple-A debut in 2016, was named the IL's Postseason All-Star at second base in 2017 with a .285 average, 38 extra-base hits, 67 runs scored, 41 RBIs and 21 stolen bases in 97 games. Prior to launching 24 homers for the Braves this year, he discovered his power stroke with seven clouts over his final 47 games with the G-Braves. Inciarte was briefly a G-Brave in 2016, hitting .333 in two rehab games while out with a left hamstring strain. The Braves' stable of potential starting pitchers includes former G-Braves Foltynewicz, Newcomb and Teheran and former Striper Sanchez. Foltynewicz, the NLDS Game 1 starter, pitched for Gwinnett in 2015 (1-6, 3.49 ERA in 10 starts) and 2016 (1-2, 1.67 ERA in 5 starts) before catching on as a full-time starter with Atlanta in 2016. He's coming off an All-Star season in which he went a career-best 13-10 with a 2.85 ERA in 31 starts. Newcomb made 11 starts for the G-Braves during his 2017 Triple-A debut, going 3-3 with a 2.97 ERA. Since joining Atlanta for his Major League debut in June of last season, he has combined to go 16-18 with a 4.06 ERA in 50 games, 49 starts. This season, he went 12-9 with a 3.90 ERA in 31 games, including 8-3 with a 2.80 ERA in 17 road outings. Teheran, the 2011 IL Rookie of the Year and Most Valuable Pitcher (15-3, Gwinnett-record 2.55 ERA in 25 games), returned to the G-Braves in 2012 (7-9, 5.08 ERA in 26 starts) before becoming a fixture of Atlanta's rotation in 2013. He has combined to go 66-61 with a 3.61 ERA in 189 starts over the six seasons since 2012, returning to Triple-A for just one rehab start in 2016 (0-1, 1.80 ERA). Sanchez made two rehab starts with the Stripers in May while out with a right hamstring strain, going 0-1 with a 10.80 ERA. He has fared much better with Atlanta, going 7-6 with a 2.83 ERA in 25 games, 24 starts. Atlanta's NLDS bullpen includes six former Gwinnett pitchers, four from the past season. Fried (2-6, 4.61 ERA in 13 starts) and Toussaint (5-0, 1.43 ERA in 8 starts) were members of the Stripers' rotation this year, with Toussaint's dominant Triple-A debut helping him secure the 2018 Phil Niekro Award for Braves' Minor League Pitcher of the Year. Sobotka (0-0, 1.93 ERA, 3 saves in 9 games) was a key member of the Stripers' relief staff in the second half, advancing to the Majors in August not long after his Triple-A debut in late July. Vizcaino, a G-Brave in 2011 (1-0, 1.29 ERA in 6 games), 2015 (0-0, 9.00 ERA in 2 rehab games) and 2017 (0-0, 0.00 ERA in 1 rehab game), pitched 1.0 scoreless inning on rehab in the Stripers' final game of 2018 on September 3 vs. Charlotte. Minter (1-2, 4.70 ERA in 17 games in 2017) and Venters (4-7, 5.62 ERA in 17 starts in 2009, rehab outings in 2010 and 2012) both pitched for Gwinnett prior to 2018. Leading the charge is former Gwinnett manager Brian Snitker. After guiding the G-Braves to a 161-164 record over 325 games from 2014-16, Snitker was elevated to Atlanta's managerial role on May 17, 2016. He has since compiled a 221-227 record in 448 games with the Braves, including a 90-72 mark this season. His staff includes former G-Braves' pitching coach Marty Reed (now the Braves' bullpen coach) and former G-Braves' catcher Jose Yepez (now the Braves' bullpen catcher). The Braves' NLDS opponent features two former Gwinnett Braves, left-hander Alex Wood and outfielder Matt Kemp. Wood, who went 9-7 with a 3.68 ERA in 33 outings for the Dodgers during the regular season, appeared briefly for the G-Braves in 2013 and 2014. He made one start for Gwinnett during his swift rise to the Majors in 2013, going 1-0 with a 1.80 ERA. Wood returned in 2014 for two more starts, going 0-0 with a 1.04 ERA. He has not pitched in the minors since, and has been a staple of the Dodgers' staff since coming over in a deadline deal from the Braves on July 30, 2015. Kemp experienced a resurgent return to the team that drafted him, batting .290 with 21 homers and 85 RBIs for the Dodgers this season. While on Atlanta's 10-day disabled list with a strained right hamstring last year, he logged one rehab game with Gwinnett, going 1-for-3 with an RBI on April 19, 2017 vs. Rochester. The NL Central champions have one former G-Brave, right-hander Jhoulys Chacin. Signed as a free agent in December, Chacin evolved into Milwaukee's best starting pitcher this season, going 15-8 with a 3.50 ERA in a team-high 35 starts. His biggest outing as a Brewer came in Game 163 at the Chicago Cubs on October 1, when he tossed 5.2 one-run innings to lead a division-clinching 3-1 win. Chacin is currently slated to start Game 2 of the NLDS vs. Colorado. Chacin made one start for Gwinnett, the 2016 season opener on April 7, 2016 at Norfolk. In a tune-up outing for Atlanta, he tossed 7.2 scoreless, five-hit frames and struck out seven for the win as the G-Braves blanked the Tides 2-0. The defending World Series champions return three former G-Braves from their 2017 run: catchers Evan Gattis and Brian McCann and right-hander Charlie Morton. Gattis saw his average dip to .226 this season after batting .263 in 2017, but raised his home run total from 12 to 25 and his RBI total from 55 to 78. As the legend of "El Oso Blanco" grew with Atlanta in 2013 and 2014, Gattis made brief stops in Gwinnett in both seasons. He joined the G-Braves twice in 2013 (.333, 1 HR, 1 RBI in 5 games) and returned while rehabbing a bulging thoracic disc in 2014 (.188, 2 RBI in 4 games). The 34-year-old McCann played 63 games during the regular season, batting .212 with seven homers and 23 RBIs. The Duluth, GA native played for his hometown G-Braves on rehab assignments in 2009 (.333, 1 RBI in 1 game), 2011 (.333, 1 HR, 2 RBI in 2 games) and 2013 (.333, 1 HR, 2 RBI in 3 games). Last year's Game 7 winner vs. the Los Angeles Dodgers, Morton produced a dominant 2018 season in the Astros' rotation, going 15-3 with a 3.13 ERA in 30 starts. He was a member of Gwinnett's inaugural staff in 2009, going 7-2 with a 2.51 ERA in 10 starts. Morton held the G-Braves' single-game strikeout record (12 on April 12, 2009 at Charlotte) until this season, when Bryse Wilson broke it with 13 punch-outs on August 15 vs. Louisville. MLB's best team in the regular season, the Red Sox compiled a 108-54 record with help from seven-time All-Star Craig Kimbrel. Kimbrel ranked second in the American League with 42 saves, going 5-1 with a 2.74 ERA in 63 relief appearances. Before being crowned the NL Rookie of the Year with Atlanta in 2011, Kimbrel logged 48 appearances as Gwinnett's closer in 2010. He went 3-2 with a 1.62 ERA, a .148 BAA and 23 saves that season, the third-most single-season saves in G-Braves' history. Kimbrel has appeared just once in the minors since, a rehab start with Triple-A Pawtucket in 2016. The Colorado Rockies, Cleveland Indians and New York Yankees do not have former G-Braves/Stripers on their current/projected rosters. The best-of-five NLDS kicks off tonight (October 4) as the Brewers host the Rockies at 5:07 p.m. and the Braves take on the Dodgers at 8:37 p.m.